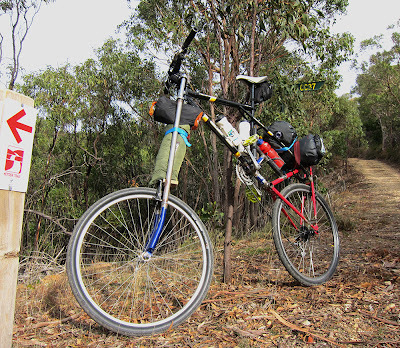 There were beautiful conditions for my overland bike packing journey which took me through the picturesque Adelaide Hills to the small town of Cudlee Creek. I carried all of the gear required for some rudimentary camping, stayed overnight in the caravan park and returned home the next day. I've made a short video of the journey for your entertainment. Whilst producing it I considered a few elements that feed into the overall theme of a portrait. The internet is carpeted with home-made videos of people recording their actions, all of them perfect for consideration as a portrait. Further to this I have been considering forms of travelog and videolog in combination with role models who espouse a sense of adventure, risk taking and the frontier. Of course, it never hurts to roll these elements in a steamy coating of gravelly masculinity, if that's the kind of man you want to be! So, my reference points for this exploration are the peerless CAPTAIN JAMES KIRK and the rugged saint, BEAR GRYLLS. I'm also quite intrigued by the 'survivalist in the tent' device and would like to share one of my favorite home made movie tent moments of all time. Jimmy's Tall Bike Adventures - Cudlee Creek Overnight Mission from James Dodd on Vimeo. Jimmy your a legend. Absolutely inspiring. Your video makes me feel lazy. I lost count the amount of times I climbed Norton summit, stopped and had a drink with ol Tom Playford.